You can also read about footbag records at: http://www.footbag.org. 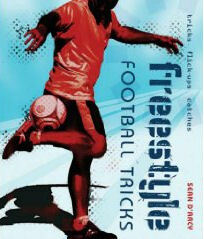 The Freestyle Football Federation has an interesting web site at www.freestylefootball.org. All "keepy uppy" - records in our list are achievements without the ball touching the ground or "resting" it on the top of the foot! New record claims are welcome! What about a record for two players for successively passing a soccer ball? Can you establish a record for heading a soccer ball while swimming? Or can you break one of the records in our list? Please contact us BEFORE your record attempt. Football (soccer ball) control in a sitting position: Kenneth Yoga (KEN): 4:30:43 hrs on 26 May 2006. 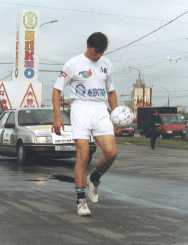 Walking while keeping up a soccer ball: Ricardo Silva Neves (BRA) covered 721 km (448 mi) in June 1992. He arrived in Brasilia after travelling for 12 days. Walking while keeping up a soccer ball, team record: A team from Aubigny (FRA) covered 113 km (70 mi 400 yd) in 11:32 hrs. Walking while balancing a soccer ball on the head: Abdul Halim (BAN), 15.2 km (9.4 mi) on 22 October 2011 at Bangabandhu National Stadium in Dhaka, Bangladesh. Running marathon while keeping up a soccer ball: Dr. Jan Skorkovský (TCH) covered 42.195 km (26 mi 385 yd) for the Prague City Marathon on 8 July 1990 in 7:18:55 hrs. Running half marathon while keeping up a soccer ball: Uno Lindström (SWE): 2:55:49 hrs on 10 August 1985. Running 100 m while heading a soccer ball: Krishnan Kumaravelu (IND): 21.20 seconds on 15 December 2013 in Madurai, Tamil Nadu, India. Running 100 m while balancing a soccer ball on the head: 18.53 seconds, Daniel Cutting (GBR) on 26 February 2011 during halftime of a match between MK Dons F.C. and Brighton and Hove Albion Athletic F.C. in Milton Keynes. Running 200 m while heading a soccer ball: Krishnan Kumaravelu (IND): 54.09 seconds on 15 December 2013 in Madurai, Tamil Nadu, India. Running 1000 m while heading a soccer ball: Agim Agushi (Kosovo) 8:50.4 minutes on 13 November 2015 at the Impossibility Challenger Games in Berlin, Germany. Running up and down stairs while heading a football: Agim Agushi (Kosovo) ran up and down 5304 stairs while heading a football in 1:37:05 hours on 31 May 2010. He ascended and descended the 59 storeys of the Messeturm in Frankfurt, Germany two times. He set another record when running up backwards 2040 stairs on Princess Tower, Dubai Marina, Dubai while heading a football on 26 October 2014. Balancing (not juggling!) a soccer ball on the head and walking: Manoj Mishra (India) covered a distance of 49.17 km [30.55 mi] while balancing a football on his head at Kolkala Institute, Kolkata, West Bengal (India) on 1 January 2016. Juggling a medicine ball weighting 5 kg ball with feet: Conny Strömberg (SWE): 234 kicks in 1:34 min on 27 November 2001 in Stockholm. Record for the most touches within 30 seconds, 60 seconds and 10 minutes can be found HERE. The fastest time for removing all "popits" from the Popitball is 11.9 seconds by Jeremy Lynch (Great Britain) on 24 July 2010.